Over the past few months, public health officials nationwide have been busy investigating various outbreaks of Salmonella and E. coli — two completely different types of bacteria — that can be present in contaminated foods. Now, with the long Fourth of July holiday and the rest of summer ahead, food grilling safety should be of concern for families, especially in the hot and muggy climate of South Florida. That’s because barbecuing in South Florida almost always entails warm weather. So it is especially important to take extra precautions when preparing perishable foods such as meat, poultry, seafood and egg products. The warm weather provides a perfect environment for bacteria and other pathogens in food to multiply rapidly and cause food-borne illness. It’s not just meats you have to worry about. Sometimes raw fruits and vegetables contain harmful germs, such as Salmonella, E. coli and listeria, that can make you and your family sick. In the U.S., nearly half of foodborne illnesses are caused by germs on fresh produce, according to the U.S. Centers for Disease Control & Prevention (CDC). The safest produce is cooked; the next safest is washed, the CDC states. Always wash or scrub fruits and vegetables under running water — even if you do not plan to eat the peel —so dirt and germs on the surface do not get inside when you cut, the CDC states. Cut away any damaged or bruised areas before preparing or eating. At the grocery store, pick up meat last. Keep raw meat away from other food products in your cart. During check-out, ask the clerk to wrap meat and poultry in plastic bags. Those steps should prevent raw meat juices (which may contain harmful bacteria) from dripping on other products. Get your packages home as soon as possible. Perishable items should be refrigerated within two hours, but within 60 minutes when outdoor temperatures are above 90°F, according to federal health authorities. Work with clean hands .Wash your hands for at least 20 seconds with warm water and soap. Inspect your cooking equipment, including the grill and meat brushes. Place marinating food in the fridge. Sauces used to marinate raw meat and poultry should be tossed, and not used on cooked food. “Don’t taste the marinade or re-use it after raw meat has been added,” Dr. Villanueva said. Preheat the grill. Fire up the coals for 20 to 30 minute before you start cooking. The U.S. Centers for Disease Control & Prevention (CDC) recommends thoroughly cooking chicken and meat, using a thermometer designed for meat to test internal temperatures. 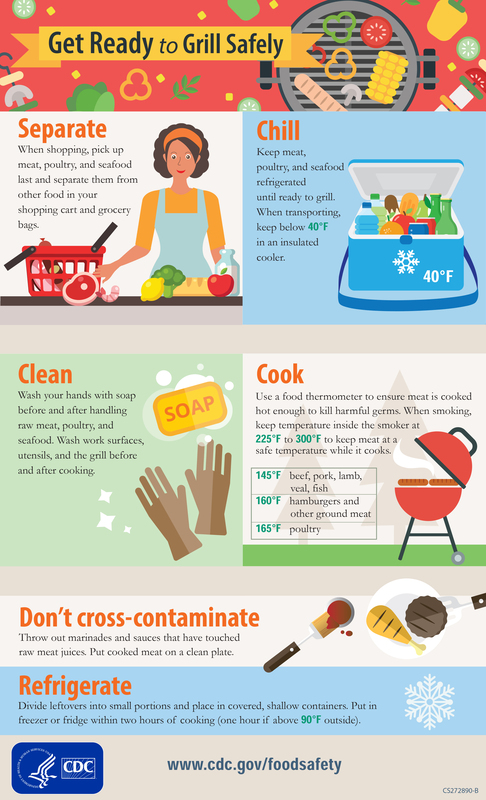 Cook ground beef to an internal temperature of 160°F, steaks and roasts to 145 ºF-160 ºF, and poultry until it reaches 165°F, according to Safe Food Handling: Seven Super Steps to Safe Food In the Summer, a government publication.